ASTEC Recruitment 2018 , ASTEC Assam Jobs: We are back with a new Job vacancy in ASTEC Assam. Assam Science Technology & Environment Council in short ASTEC latest job notification is out for July 2018 and everyone is exciting about it. According to the latest ASTEC Recruitment 2018 notification , Interested Indian Citizens with minimum requisite qualification are invited to attend a Walk-In-Interview for temporary engagement of Project Staff in the projects as indicated against the respective designations under Assam Science Technology & Environment Council (ASTEC Assam). We shall discuss more about this ASTEC job in the following section. 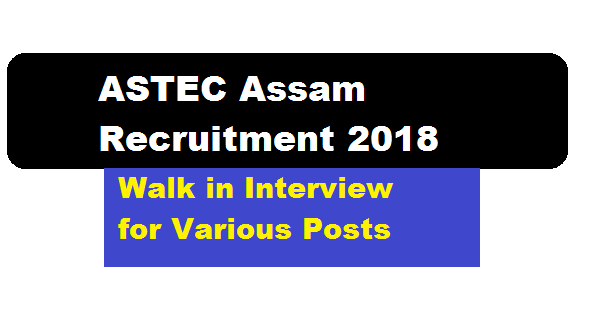 In this section, we will be discussing details about the Recruitment of various Posts Under ASTEC Assam Recruitment 2018 with all the important requirement criteria to apply for the posts. Educational qualification : Candidates must posses 1st Class BE/B.Tech in Civil Engineering from a recognised institute/university. Educational qualification : Candidates must posses B.Com. with minimum of 50% marks in Major in Accountancy. Working knowledge in Tally is essential. Eligible and interested candidates may come with application in Standard Form giving details including contact number, email, etc and submit a set of photocopies of their self-attested testimonials as per the date, time and venue as mentioned in the table above. Original documents will be verified during the registration. Registration of candidates will be closed at 11.00 am for Sl.1, 3 and 4 and for Sl. No. 2 it will be closed at 1.30 pm. The candidates must be dynamic and energetic with enough voluntary zeal and inclination towards travel and hard-work. Candidates without requisite minimum qualifications and desirable qualities need not attend the interview. We have already discussed about the interview dates and timings for various posts under ASTEC Assam Recruitment 2018, July. In the below section we have mentioned the interview venues for various posts under ASTEC Recruitment. Venue 1 : – Venue of Interview for Sl.1, 2 and 3 is Regional Science Centre, Khanapara, Guwahati. Venue 2 :- Venue of Interview for Sl.No.4 is Bigyan Bhawan, GS Road, Guwahati 781005.